Video thumbnail is the most visible part of any video search listing on YouTube. It is an element that could make your video gain importance on YouTube video search listings. Title and description are also important for a YouTube video to gain prominence on the video-sharing website. YouTube Video SEO service is becoming more and more specialized with the intensification of YouTube. Whether you’re looking for new designs or new thumbnail strategies, research always comes handy. Before starting with any video you need to check for matching video titles already available on YouTube. For the very purpose, there are several YouTube search filters. By looking into several related videos, you can come across various elements that are appreciated as well as received negatively by users. Search in-depth with strolling channels and playlists to find related content. Yet another thing that you can get from researching other videos is elements that have been omitted. You can add these elements to your video content for catering to distinct and ever-changing user requirements. Why YouTube Auto-Suggest is a great tool for content creators? Because it shows you the most relevant searches that users are searching for right now. In order to get ranked for less competitive phrases, it is important to use specific key phrases. This is a great way to stand out as well as gain good traffic. For this purpose, you can make use of YouTube Auto-Suggest feature. Most Video SEO Services for small business invest a great deal of time in researching all possible YouTube Auto-suggested results for any specific video. If you’re doing YouTube research on your own, ensure to go through YouTube Auto-Suggest a lot of times. The Live Events feature allows YouTube video SEO service experts and individual professionals to provide live video content to YouTubers. Although it is more useful for established YouTube channels and content caterers, the feature can also be used well by new channels making use of apposite Video SEO services for small business and content creators to entice users by presenting a one-time or some exclusive event. YouTube allow content creators to redirect traffic to relevant merchandise, educational, eCommerce, and crowd funding sites or web sources. For this, content creators can make use of cards and end screen in videos. These usually appear at the end of a video, therefore it’s important to entice users with such video content that keep them tuned till the end of the YouTube video. YouTube provides powerful features for content creators to provide clients with the most suitable video content. Check out the 4 best YouTube SEO features. Vishal Vivek is the Co-Founder & CEO of SEO Corporation, an award winning SEO & Web agency. A motivational speaker, blogger, gut wrenching risk taker, pet lover and workaholoic CEO. Credited for taking SEO Corporation from living room to immense heights with his vision and brute passion. When he is not writing or researching, you can find him deeply engrossed in books or playing with his pets. If you found this "Make youtube video seo better with these 4 features" beneficial than you can find such more similar article in our blogging tips and seo tips section. Thanks for visiting avdhootblogger. 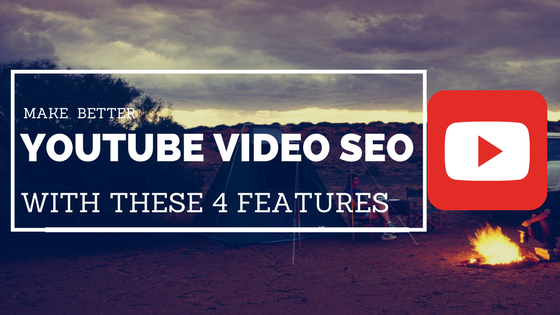 Description : Make YouTube Video SEO Better with These 4 Features.